Teenage Shrewsbury Town goalkeeper Callum Burton is still to determine what his future holds when his current contract runs out in June. The ex-England Under-18 international, who made his Town debut on the final day of the season, is one of 17 players whose deals are set to expire. "It's a case of waiting to see what happens," Burton told BBC Shropshire. "There are a lot of lads out of contract here, because a lot signed two years ago," added 19-year-old Burton. 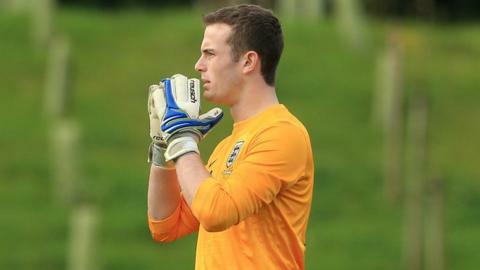 'Follow your Hart' the best advice for Burton? Speculation has previously linked him with Wolves, Aston Villa and even Glasgow Rangers. But Newport-born Burton has witnessed the route to the top taken by England's number one, fellow Shropshire lad Joe Hart, who did a full season as Shrewsbury keeper a decade ago. "I've grown up watching the club," he said. "I want to stay and play for the team as much as I can. We will have to see what happens to everyone. "It feels like I've been waiting a long time to get on the pitch, because I've been here since I was 10. But I couldn't wish to make my debut for a better team." The League One club have until 23 May to tell their soon-to-be out-of-contract players if they want to keep them or not. Shrewsbury, who finished 20th, remained at the third tier of English football by four points in the end, having secured their safety on the penultimate weekend of the season. Town boss Micky Mellon last week revealed that he is to remain as manager next season, following their relegation near-miss.